By meditating we can mobilize potential. This practice is essential for renewing energy, balancing emotions and exploring possibility. As North America’s only fitness professional with advanced training in Yoga Nidra as well as Level 2 Teacher Certification in Kundalini Yoga & Meditation, Susan is uniquely qualified in this field. She has showcased this expertise in her inspiring CDs and downloads. Achieve profound relaxation for your body and mind with this 45-minute guided meditation. Relax, rejuvenate and refocus by treating yourself to Susan’s first yoga nidra CD. Included is heart felt prayer, body sensing, pranayam (breathwork) and visualization. Tired? Exhausted? Stressed? Too busy to relax or meditate? 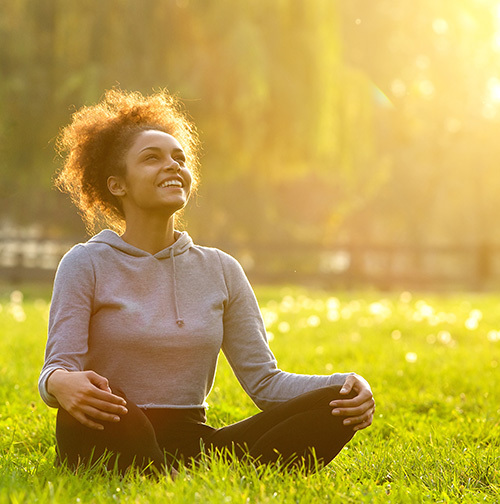 Take time out to deeply relax your body and mind as Susan guides you through soothing strategies and teaches you a 15-minute calming meditation. Let Susan guide you into a deep state of relaxation with two 30-minute meditations. CD includes heart felt desire, inner resource (new) body sensing, pranayam (breathwork) and a new manomaya kosha…emotions (insecure/secure & happy/sad). Achieve a deep state of relaxation with two 30-minute meditations. Included is heart felt desire, inner resource (new) body sensing, pranayam (breathwork) and a new manomaya kosha…emotions (calm/stress & peaceful/angry). Bringing a strong mental component to your sport is as important as building your physical fitness. That’s why Susan, former international elite athlete released a CD for athletes. Take time out to deeply relax your body and mind as Susan guides you through a meditation to help you stay focused, goal set and work with your power, strength and determination. Time and uncertainty – these are the two most common barriers to meditation. This 16-minute guided meditation can be done by simply sitting and listening. It’s the perfect introduction to meditation and will allow you to achieve a state of relaxation using body sensing and pranayam (breathing) techniques. For the first time, Susan is teaching meditations using online video downloads. Through a video and handout she makes meditation more easily accessible for you to do in the comfort of your home, at work or in the classroom. Detailed instructions are included in the download.